There’s a gaping hole in the Alaska Highway, where up until yesterday there laid what was once referred to as the largest culvert of its kind on the globe. IRON CREEK, B.C. 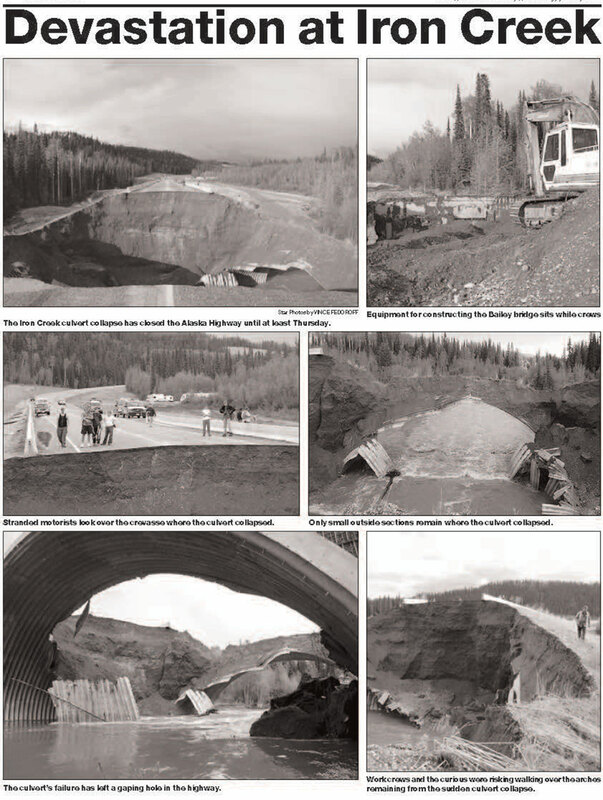 – There’s a gaping hole in the Alaska Highway, where up until yesterday there laid what was once referred to as the largest culvert of its kind on the globe. Today, the culvert is a twisted, mangled waste of galvanized steel. Bolts, tens of thousands the diameter of a big thumb, broke like bread sticks under the pressure of the implosion. They popped off non-stop for almost two hours, as though someone had lit an endless row of firecrackers, eyewitness recall. The collapse of the multi-million-dollar structure forced the closure of the Alaska Highway some 50 kilometres south of Watson Lake, a hair inside the B.C. border. Meanwhile, the region’s heavy rains of the last few days have not affected Highway 37, the Stewart-Cassiar Highway. A temporary, one-lane Bailey bridge was scheduled to arrive from Grande Prairie, Alta. between noon and 2 p.m. today, Iron Creek Lodge co-owner Dee Hinson said in a telephone interview this morning. “We are still confident the road will be open tomorrow,” she said. Hinson said crews, using heavy equipment from a nearby road reconstruction site, worked until after midnight to rebuild bridge abutments and approaches that served the old Bailey bridge until it was replaced by the culvert in 1998. Officials with the federal Department of Public Works, the engineering company that engineered the project and the Whitehorse construction company that installed the culvert were unavailable to discuss possible reasons for its collapse. The federal government is responsible for that section of the Alaska Highway. Bystanders – road construction workers working in the area, tourists and Watson Lake residents who drove down to look for themselves – appeared almost in awe Tuesday evening as they tiptoed as close as they dared to the edge of the missing highway. The hole over Iron Creek spanned the entire 19-metre (62-foot) width of the culvert, and then some. From the top of asphalt to the flooding waters of Iron Creek was no fewer than eight metres. If the highway collapse had to happen, it was good that it occurred in daylight, one bystander pointed out. Had the same thing happened in the middle of the night, night-time motorists would easily have been caught unaware, and they and their vehicles would have simply crashed into the hole, one after the other. As it was, the failure of the roadway started sometime before 7 a.m., as motorists began their day’s travel, as road construction crews working south of Iron Creek started out for work from the Iron Creek Lodge. Road worker Bob Froess passed over the three-year-old culvert at about 6:45, on his way to the construction site. “I noticed the dip,” Froess said in an interview last night while having coffee at the lodge. “But it was only about this big,” he said, creating an unsuspicious span about the height of a grapefruit. When he returned half an hour later, however, the dip had turned into a significant wow! in the road surface above the culvert. Road workers in the area and others had taken steps to block off highway approaches on both sides of the creek. It is said the last two vehicles to cross over Iron Creek were a recreational vehicle, followed by a truck pulling a horse trailer. The brake marks that run for 10 metres along what’s left of the culvert deck belonged the woman pulling the horse trailer. When the truck and trailer hit the growing depression, it’s believed it triggered somewhat of a bronco ride, causing her to hit the brakes and skid for some distance. What skid marks can be seen on the remaining highway surface are only partial, the other portion long since washed down Iron Creek, it was suggested in coffee shop talk. By the time Hinson travelled the two or so kilometres down the creek crossing, the roadway had been blocked off. From the time Hinson and Froess parked their vehicles along the highway shoulder, and walked down to the bottom of the culvert approaches at creek level, for a look below, the implosion had begun in earnest. The bolts were popping off, the road surface was sloughing in, and the culvert was buckling. “And it slowly caved in,” Froess said, adding it was almost two hours until it was all down at around 9:30. Froess said there is no doubt in his mind the road failure was tied directly to the incessant rainfall the Iron Creek area experienced recently. “It rained for four days here, 24 hours a day,” he said. “Not yesterday, but for the four days before that. Hinson said the water will have to go down before the teams of engineers who were en route to the site yesterday and today can get a good start into their investigation of what happened. And just as quickly as word of the culvert collapse and road closure spread north and south along the Alaska Highway, business at the Iron Creek Lodge dried up. He suspects there are maybe 500 RVs backed up all the way south waiting to come north. For some, time isn’t a factor and a delay of a few days doesn’t mean much. But for others on a tight vacation schedule, a two- or three-day road closure, plus the thought of future delays caused by backed-up north- and south-bound traffic taking turns crossing the one-lane Bailey, the delay has already probably turned them around, Hinson surmised. Distinctly noticeable on the highway Tuesday between Whitehorse and Watson Lake was the absence of the usual parade of RVs and vehicles with out-of-territory and out-of-country plates. And shop owners along the highway were noticing it. We (from Florida) were one of the RVs caught south of the collapse at Poplars CG on the Toad River. Ten rigs scrunched up in three sites. We pulled out some liquids and got acquainted. We made the best of it with our good neighbors.